Do they race out the door each morning, eager to find out what’s going to happen in their class today? Well, that’s how St. John’s Episcopal School students feel about school, and it is our goal to keep that love of learning alive from the day they arrive to the day they graduate. Below and throughout our website, you’ll get a glimpse into our dynamic, personal approach to education, but there is so much more. 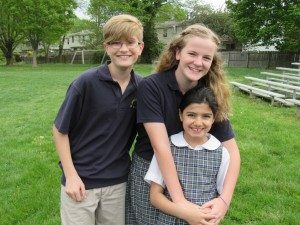 Come visit to see our classes in action and learn firsthand about our mission-driven Accelerated Academics, Character Education, and Community of Faith as well as our Global Perspective. Come see our 1st graders go on a Measurement Scavenger Hunt and create Area Robots. Observe our 2nd graders recreate a day in the life of a Colonial American child, dipping candles and writing with authentic quill pens. See how our 4th graders tackle writing and publishing a book. Hear from 7th graders how participating in the Model United Nations changed their view of the world. Watch the joy of Big and Little Buddies reading together. It’s the daily interactions that students have with their teachers, peers, and younger students that shape who they will become. Come see the smile that accompanies the success of a beginning reader. Come see St. John’s! Preschool: 9:00 a.m. – 1:00 p.m. or 3:00 p.m.
K-4: 8:20 a.m. – 3:00 p.m.
5-8: 8:20 a.m. – 3:15 p.m.
Preschool: 9:00 a.m. – 1:30 p.m.
K-4: 8:20 a.m. – 1:30 p.m.
5-8: 8:20 a.m. – 1:45 p.m.